Apple’s iPhone and iPad can make your life easier in a variety of ways. One of the very simple yet useful apps that come with every iPhone and iPad is Reminders. Reminders is a very handy to-do list app. Most people can’t imagine their lives without their smartphones. They carry their phones with them everywhere. Most likely, you also have your phone with you most of the time. You have various ideas that pop into your head every now and then about things you need to do or buy. It is possible that you are walking by a store and see something that you need to buy at some point in the future. It is also possible that you go for a run or are running errands and suddenly remember that you need to do something. This is what Reminders is great for. You can simply open the app, jot down your idea or to-do and save it in the app. 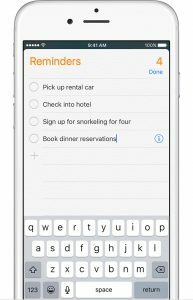 With Reminders, you can organise your to-dos and reminders in custom categories and lists. You can also sort and organise the lists by date or category. The app allows you to see your reminders next to a very useful calendar. It goes without saying that an app such as Reminders has a feature that can remind you about what and when you need to do something. If you have location services enabled on your device, you can also have location-based reminders. For example, you can set a reminder to buy bread when you are close to a certain store. Another simple yet extremely convenient built-in app is Clocks. Clocks can be very useful if you travel a lot around the world. The app can display clocks with time from different cities and countries in the world side-by-side so that if you are in Tokyo, you can easily see what time it is right now in Amsterdam.